We want readers to be able to see that the implementation process is really pretty simple when it’s boiled down. Natural gas pipeline components manufacturer and lean company R.W. Lyall announced today it has published a set of lean 5s tips for manufacturing companies “overwhelmed” by the implementation process. The company hopes the document, which is published on its blog, will inspire more companies to adopt lean practices. Lean 5S is the term used to describe a specific approach to workplace organization and methodologies. The Lean 5S method originated at Toyota Japan and was based on five Japanese words—seiri, seiton, seiso, seiketsu and shitsuke. Today, the term has evolved for application in various contexts. In the manufacturing industry, though often still referred to as “5S,” the method now includes a sixth “S”—safety. Hernandez said Lyall incorporates that approach. In recent years, the Lean 5S approach has gained worldwide attention, and widespread adoption, for its effectiveness. Lyall was founded in 1970 by Robert W. Lyall. Lyall built the company to manufacture the best pipeline components available to the natural gas industry. With an emphasis on quality and a business philosophy that puts the needs of the customer above all else, Lyall succeeded in that mission. Today, the entire Lyall team maintains this legacy of quality with continually expanding operations that now include 200,000 square feet of manufacturing space in two facilities in Corona, Calif. and New Berlin, Wis. More than 250 employees produce and distribute 22 Lyall product lines across North America. 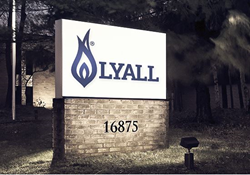 In January, 2016, Lyall was acquired by Burndy, LLC, an affiliate of Hubbell Inc. based out of Shelton, Conn. Today the company is part of the Hubbell Gas Connectors & Accessories (HGCA) group.